Amarillo is one of the few places where the Old West is literally only steps away as you move from the modern twenty-first century to the many surrounding working ranches that are essentially unchanged from the late 1800s in their day-to-day operations. Francisco Coronado was the first European to see the vast open spaces of what would one day be the Texas Panhandle – nearly 80 years before the Pilgrims landed at Plymouth Rock. The roving tribes of Indians had dominated the area for centuries and were one of the last strongholds against the invasion of the “White Man.” After the last hold out ended in the Red River War in 1875, the “staked plains” were opened to settlement. The vast, empty territory was immediately sought out by buffalo hunters while the soldiers at Fort Elliott were tasked with keeping the Indians on Oklahoma reservations. In late 1876, Charles Goodnight drove a herd of longhorn cattle into Palo Duro Canyon to begin the first Panhandle ranch. Quickly following, more cattlemen and sheep herders headed to the area for fresh grazing grounds and a place to start a new life. 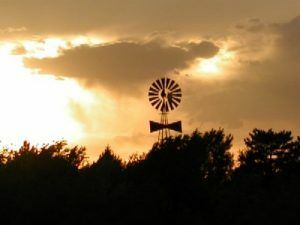 A windmill against the backdrop of a sunset in Amarillo. May, 2004, Dave Alexander. 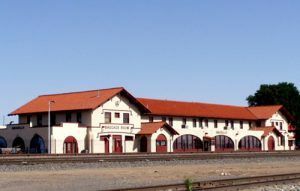 In 1887 and 1888, two railroads crossed the Panhandle, opening up the former “frontier.” When the Fort Worth and Denver City Railroad came through the area, Amarillo was born as a tent city by railroad workers. J.T. Berry, a town site developer from Abilene, Texas quickly began to develop the settlement and on August 30, 1887 it won the designation as the Potter County seat. The town was first named “Oneida,” but soon changed to Amarillo, meaning “yellow” in Spanish for the color of the soil on the nearby banks of Amarillo Creek and the abundant yellow wildflowers during the spring and the summer. Most of the town’s first houses were painted yellow in commemoration of the name change. The Spanish pronunciation, Ah-mah-ree-yoh, was first used to describe the settlement, but that was short lived. As the conductors along the railroad passing through called out their English pronunciation of “Am-ah-rillow,” the beautiful original articulation was lost forever. Just months after its founding, Amarillo boasted a post office, several stores, a temporary frame courthouse, and soon a 25-room hotel called “The Champion.” In the spring of 1889, when heavy rains almost flooded “Old Town,” most of the settlement moved about one mile east to higher ground. The first newspaper was founded in 1887, the second in 1889 and the surviving newspaper, the Amarillo News, was founded in 1892. By 1890, Amarillo had emerged as one of the world’s busiest cattle shipping centers and had grown to a population of nearly 500. Industry in Amarillo thrived in the early years because of railroading, cattle and merchandising. 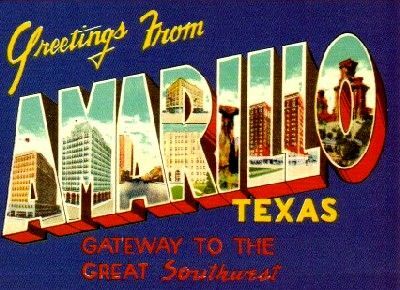 Amarillo’s population was more than 1,400 by 1900. At the turn of the century, fencing of ranges began farmers began to plan wheat, further developing the Amarillo area into a major wheat belt. Construction of the Southern Kansas, the Pecos and Northern Texas, and the Chicago, Rock Island and Gulf railroads by 1903 added to the shipping facilities further increasing the population. The Amarillo Independent School District was formed in 1905, and by the following year a new stone courthouse and jail were completed, after a bitter court battle over ownership of the courthouse square. The Amarillo Street Railway Company began operating its electric streetcar lines in January 1908 and by 1910, Amarillo was called home to almost 10,000 residents. The sudden influx of people with the railroads resulted in the rise of Amarillo’s Bowery district, notorious for its saloons, brothels, and desperados; and where crime was commonplace. Gas was discovered in 1918 and three years later oil was found and the black gold frenzy exploded across the Texas Panhandle as vast fortunes were made overnight. Dust Bowl days in Amarillo, Texas, by Arthur Rothstein, 1936. 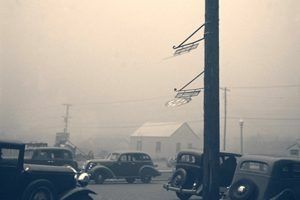 The 1930s brought drought and black dust bowls to Amarillo, but the decade also saw the rise of tourist stops, numerous motels, and restaurants as Americans began to feverishly travel Route 66. Today, Amarillo is called home to more than 175,000 people where gas, petroleum, agriculture, and cattle are the principal sources of income. The Amarillo area is now a major destination for Old West and Route 66 enthusiasts from all over the globe. The lure of the Old West also draws thousands every year to attractions like the internationally-famous outdoor musical “Texas” and Cowboy Morning Breakfast, both held at Palo Duro Canyon.